Now you can produce jump rings quickly and easily with this time-saving device. Coil your wire around one of the twenty mandrels (in the diameters 2.5, 3, 3.5, 4, 4.5, 5, 5.5, 6, 6.5, 7, 7.5, 8, 8.5, 9, 9.5, 10, 10.5, 11, 11.5, 12mm) using the included hand-winder. Once the coil is formed, place it in the adjustable coil holder and saw through it using the included rotary saw, handpiece guide, and your flexible shaft machine. It's that easy! The redesigned Pepetools Jump Ring Maker has a new aluminum stand to organize your mandrels in an upright position. This stand conserves space on your workbench and is removable from the base of the unit. The hand winder can be permanently attached to the black, powder-coated aluminum base of the machine, or you can attach it to the included round aluminum flange (shown in the right foreground of the photo) for mounting elsewhere. The arbor that supports the rotary saw is now made from stainless steel. The cutting box, handpiece holder, mandrels, and mandrel stand are precision machined. The Jump Ring Maker is made in USA. Note: Flexshaft machine with a 1" diameter handpiece required (not included). You can us our item 390-110 or similar. .- Powder coated black aluminum base. 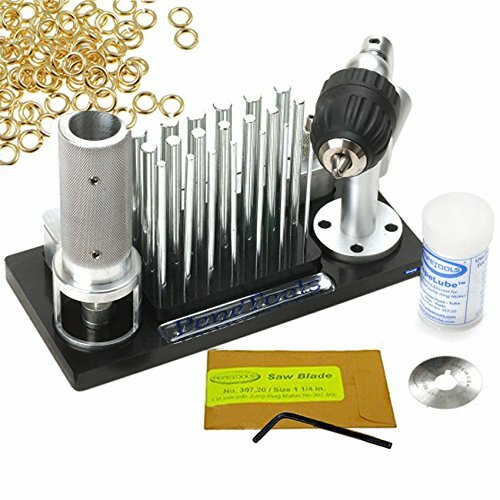 .- Precision machined cutting box, hand-piece holder, mandrels, mandrel base, and more! .- Stainless steel blade arbor. Powder coated black aluminum base. If you have any questions about this product by Pepe Tools, contact us by completing and submitting the form below. If you are looking for a specif part number, please include it with your message.